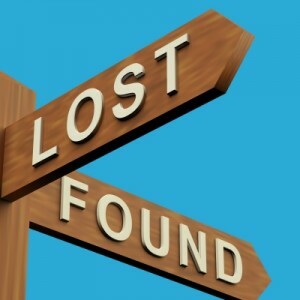 Lost & Found is located at our Volunteer Check In (VCI) Desk. Every year we donate a lot of stuff (including dozens of water bottles, single pads, and nameless notebooks full of really awesome detailed class notes). 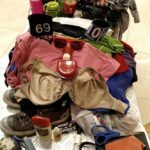 We search on our Lost & Found facebook group for owners of lost stuff, but unfortunately, most of the stuff you lose stays lost. Don’t let that happen to you! We sometimes announce found wallets or keys on our tweet (along with raffle winners and schedule changes). But, it’s a good idea to leave keys in your room. 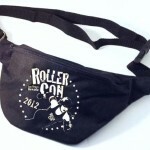 Text “follow RollerCon” to 40404 to get tweets. See what kind of stuff we tweet. 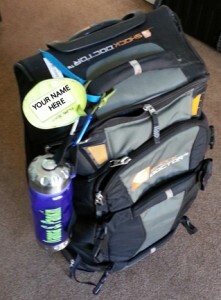 Write your name on everything; pads, skate bag (especially if you have a common derby bag! ), on the tag inside your favorite hoodie: EVERYWHERE. Sharpies are your friend. Plan on losing your phone. Tuck a sticky note with your name and room number inside your phone case, or even better: make your phone’s lock screen image a photo of your email address, room number and/or the phone number of a trusted friend [who is also there] so a finder can contact you directly. 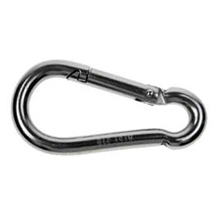 Attach everything you want to keep with carabiners, especially your water bottle. Put a luggage tag on your skate bag. Photocopy the front and back of your credit cards and leave that photocopy somewhere safe (not on you! I leave mine at home so I can call home to get it if anything goes wrong). If you lose your wallet – or its stolen – you’ll be so glad to have that info! Also, thieves steal your credit card in Vegas; it happens to everyone! Check your fraud protection and leave vulnerable cards at home. Make yourself a contact list of friends that are at RollerCon and leave it in your room. If you lose your phone, you won’t lose your entire tether to reality. 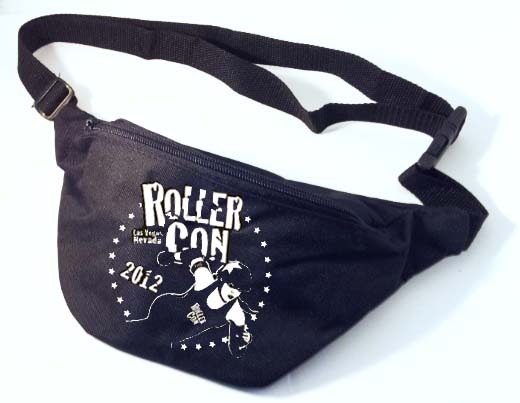 Two words: Fanny Pack. Its not a fashion statement – its a necessity. A fanny pack (or if you’re European and think the word “fanny” is hilarious, a hip pack) is a great, ZIPPED place to carry phone, wallet and room key, and its attached to you. Stow in your skate bag while on the track. Perfect! Stow your skate bag under your team bench. Each Challenge and Bout team will have a designated Ready Area. Once you’re geared up, zip your shoes and other stuff in your bag and take it with you to stow under your bench. 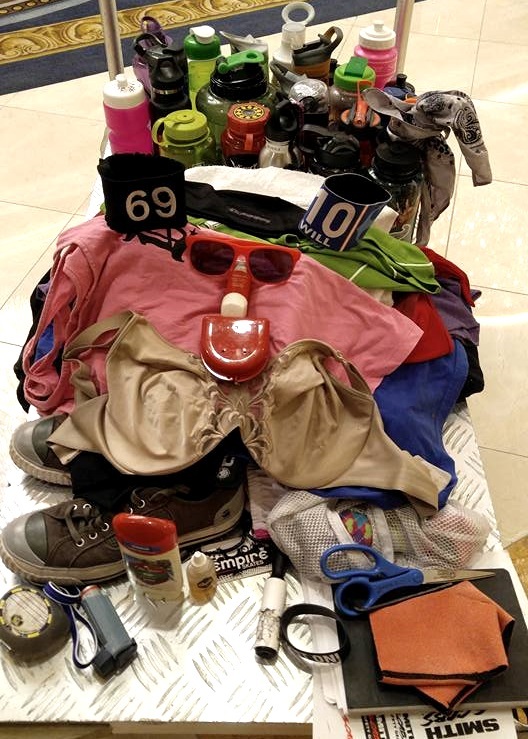 Marvel at how many skaters leave their stuff strewn around the ready area, bag open and crap falling out, then can’t find half of it when the challenge is over and another team is gearing up there. Control your liquor intake; dehydration gets you drunk faster! Make sure you are with friends that won’t leave you. Security finds drunk, lost skaters in the halls all the time, and those are the ones that typically lose phones, wallets, etc. And think twice about being that idiot in the first place. Las Vegas is not a safe place to be alone and vulnerable; losing your phone is definitely not the worst thing that can happen to you. Find out more.